Students used the TouchCast app to record book commercials. Students chose a book they were interested in to read and then gave their recommendation of the book, including an Emoji rating! **Check SeeSaw to see your child's individual project. Students used the Book Creator app to make their own historical fiction stories. Their stories needed to be both historical, but also fiction. Emily did an awesome job with her project! **Check SeeSaw for your child's individual project. Students used the ThingLink app to create interactive images of their types of connections they made to the book we read as a class "Because of Winn Dixie". Great job, Laney! Students used a Book Creator template I created for some practice with sequencing events. Way to go, Harrison! Scroll through the Adobe Spark Page to check out our Grammar Rocks Breakout Box! Students created "Wanted" posters complete with descriptions of certain text features. 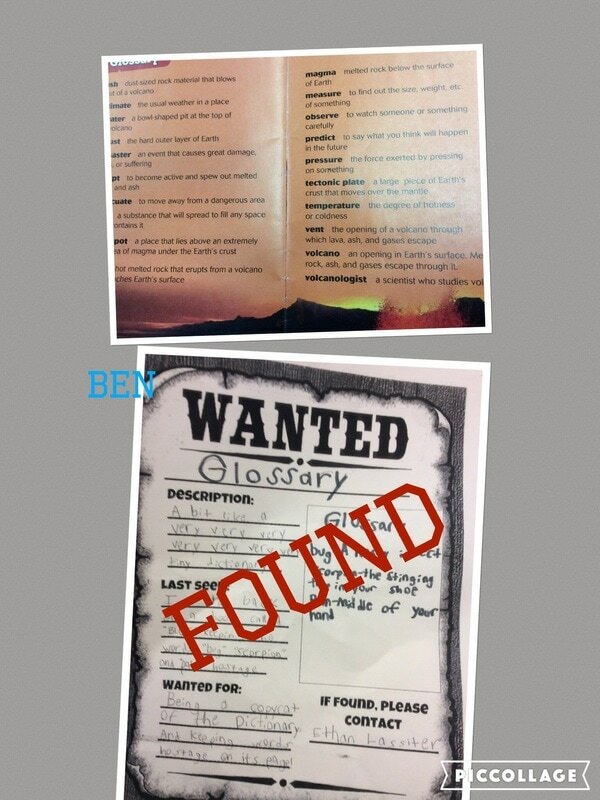 We then swapped posters and had to find the "Wanted suspects" and document them with the PicCollage app. Great job, Ben!